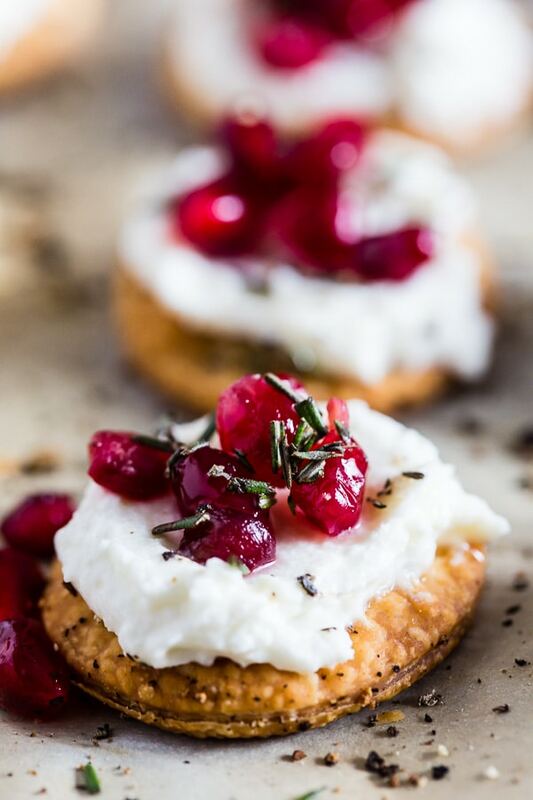 These beautiful whipped goat cheese pomegranate bites are made in less than 30 minutes and are the perfect stunning holiday appetizer. 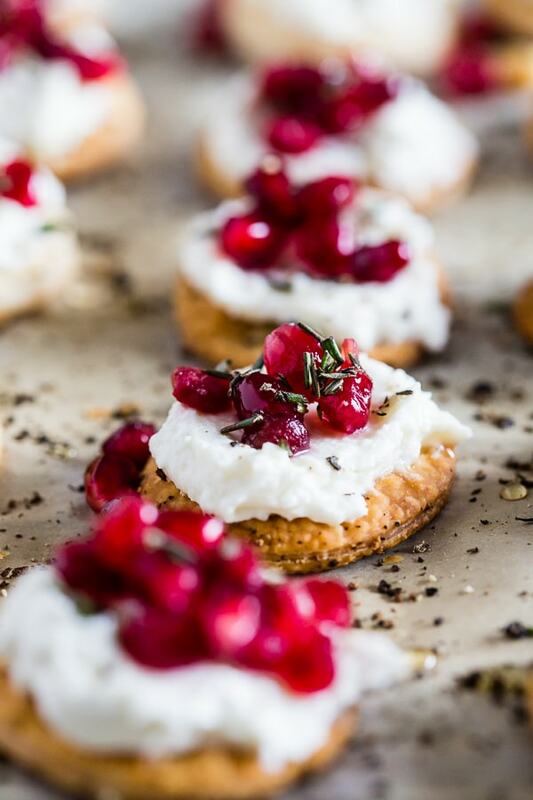 Store bought pie crust is cut out and baked into little flakey cracker rounds and topped with honeyed whipped goat cheese, pomegranate seeds and a sprinkling of honey and rosemary. You will love this new quick and easy holiday appetizer! This post is sponsored by General Mills. As always all opinions are 100% my own! Growing up every single Christmas went the same way. Christmas day was celebrated at my grandmas with ham, tons of side, a million desserts and tons of presents. Christmas eve was celebrated at home with TONS of appetizers and desserts and also (weirdly, I know) when we opened all of our presents. Now, growing up I have to admit something. I’m a bit of a Scrooge. Rarely do I ever put up a tree because the thought of decorating the house to only put it away in a month just exhausts me. I love being in a big decorated house but actually doing the decorating is just something I’m really into. I guess this means that at the ripe old age of 34 I’m a grump. It was bound to happen. However, one thing I will NEVER give up is my love of appetizers on Christmas Eve. Seriously, I don’t want a big meal I want all the apps and all the desserts. Well, I guess now that I have become an adult I guess I also want all the aged eggnog. Becuase nog just goes with Christmas – am I right? During the day on Christmas Eve, my mom and I would bust into the kitchen and make so. much. food. Of course, the classics were presents – meatballs, little smokey sausages wrapped in crescent dough and my mom’s “famous” cheesy burger dip. Which as I type all of this out I realize I have never even put on the blog. What is wrong with me?! I really need to change this ASAP! You need that dip in your lives, people. We would also sometimes cook up a big batch of shredded chicken for warm shredded chicken sandwiches which are an Ohio staple. I also just realized I should put those on the blog too. For desserts we kept it classic – sugar cookies, some sort of gingery cookie and then (ALWAYS!) PEANUT BUTTER BUCKEYES! Buckeyes are also an Ohio Christmastime staple. If you visit Ohio and Christmas and go to someone’s house and they don’t have buckeyes you need to leave. They are not a true Ohioan or they are really weird. Of course, none of that is true if they have a peanut allergy. 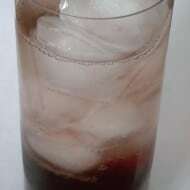 Then it’s ok.
Now, I will say that 13-year-old Brandy and 34-year-old Brandy have a few different tastes. While I still crave all my childhood favorites I like to switch it up every now and again. I never had goat cheese till I was well into my 20’s and the first time I had it I was not a fan. I KNOW! What was wrong with me? Luckily now I have my head screwed on tight and I luuuuuuuurve it! Seriously, the number of times I have used goat cheese on this blog should be outlawed. Here is a fun little side note: for this campaign with General Mills and Sam’s Club I had to pick which my holiday entertaining style out of 4 different options and then those options paired up with a product. I read through them all and I knew hands down I was Appetizer Artiste – “To you, nothing is more important than a good first impression.” alright General Mills stop reading my diary. Of course, first impressions are important to me. I live to impress! 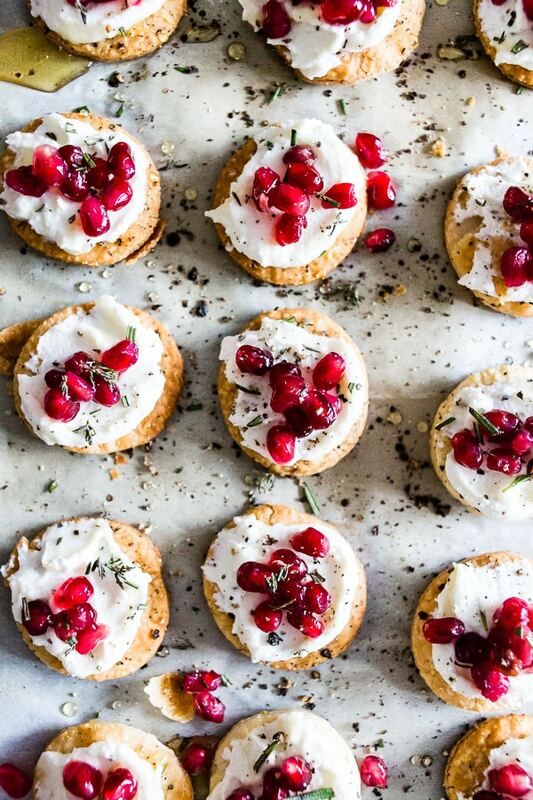 And I think these little whipped goat cheese pomegranate bites 100% impress without taking hours to prepare. That is a pretty important combination. And I love how easy it was to take something like pie crust and transform it into something totally unexpected. Cooking is kind of amazing in that way, right? Also, no sweating the small stuff if you can’t find pomegranates in your store. 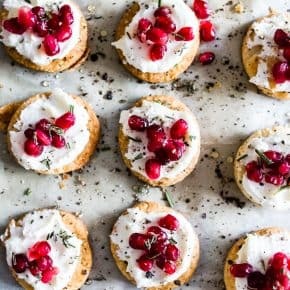 Not only are these little whipped goat cheese pomegranate bites delicious without them they could easily work with pears, apples or even berries! Preheat oven to 450 degrees and line a baking sheet with parchment paper, set aside. 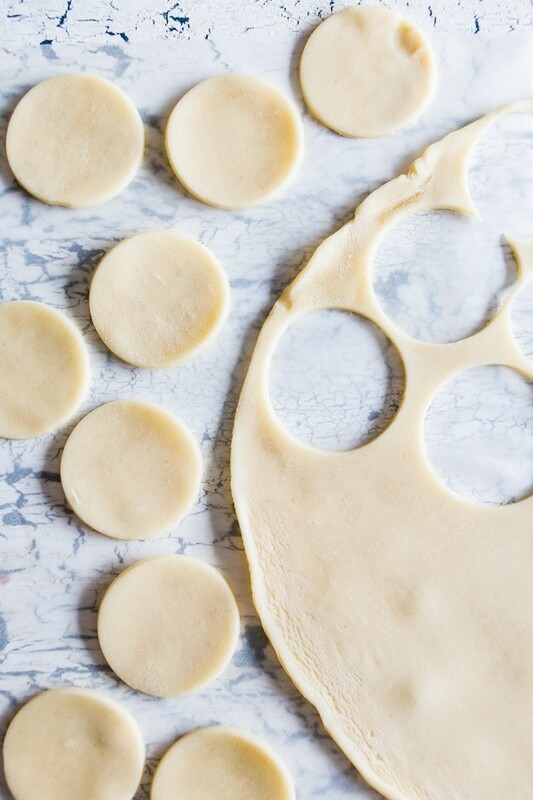 Using a small 3-inch cooking cutter cut out little round in your pie crust. Cut out as many little rounds as you can get out of your pie crust - about 24 rounds. Lay your pie crust rounds onto the prepared baking sheet. Brush each round with olive oil and sprinkle each one with cracked pepper. Using a fork poke each round a few times so it does not puff up too much. Bake for 5 minutes or until they are golden brown. Remove from the oven and let cool. While the pie rounds are cooling in a bowl add goat cheese, 1 tablespoon honey, 1 teaspoon minced rosemary, lemon zest, grated garlic and 1 tablespoon heavy cream. Using a mixer blend together until whipped and easily spreadable. if it's too thick add a bit more heavy cream until you have reached desired texture. 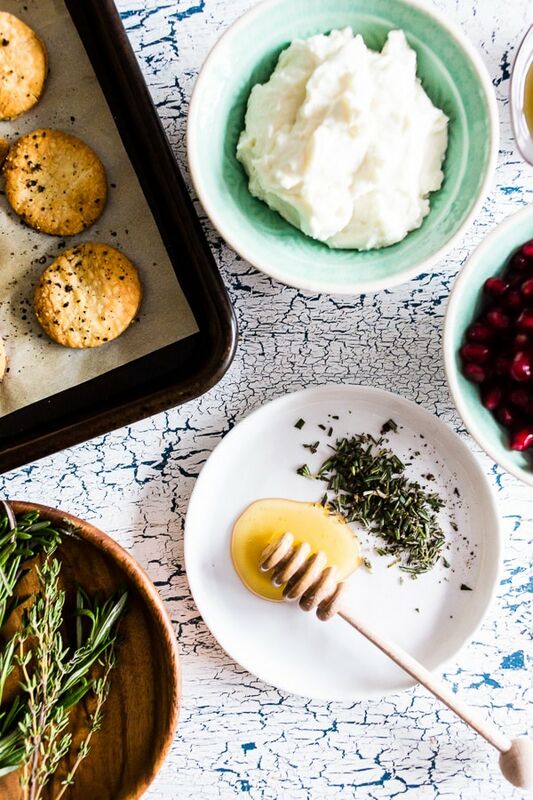 Spread the whipped goat cheese onto the cooled pie rounds, top with a few pomegranate arils, a sprinkling of the remaining rosemary, a drizzle of the remaining honey and a few cracks of black pepper. YUMMERS! Hello perfect holiday app! Such beautiful and festive holiday bites. 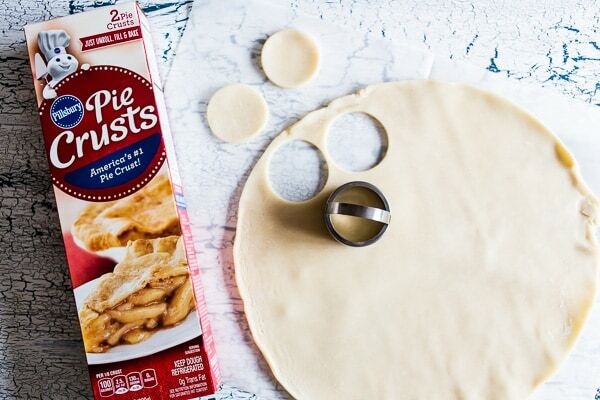 Love this fun idea for pre-made pie crusts! Oh these look completely delicious! I love that you made your own crackers! I am with you – I love appetizers and this one is gorgeous! I’m all about the apps on Christmas eve also! They are all I want! What perfect, little, festive bites! I could just eat apps and be perfectly happy! Absolutely need to make these for our Xmas Eve party! Saving this for Christmas! They look delicious! Seriously gorgeous appetizer! Mind if I sneak a few?! 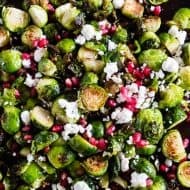 This is the perfect holiday appetizer!! YUM!! The black pepper pie crust is so inspired! You’ve come up with a real winner here, Brandy! We open all of our presents on Christmas eve too! When I was growing up we had Christmas eve at my nana’s and then Christmas lunch at my Mas house. We got presents from Santa on Christmas morning but all others were done Christmas Eve. 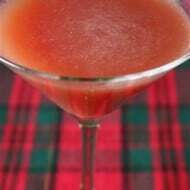 We use to do a meal on Christmas Eve but this year were thinking of doing appetizers and desserts too! Might have to make these! I’ve still never had goat cheese but I have had those Pillsbury pie crusts and they’re my favorite! There are so, so beautiful!!! Seriously these are stunning! I love goat cheese and honey. Do you know if these rounds would keep well for a day? I have a work party I’d love to bring these to, and was hoping I could bake the rounds and prepare the toppings (separately) the night before, and then assemble them day-of. Hi Erika! Sorry, I’m a few days late in replying. Yes, the rounds should hold up well since they are just pie crust. Hope you enjoy them!